Where's our summer gone?! Those of you living in the Vancouver area, isn't this weather a downright bummer? I know "we need the rain for the trees and the grass and the birds" and blah, blah, blah (I don't need to hear that, especially when I say it myself to the girls). It's rainy, and drizzly, and gray, and cold. Cold, I say for mid-July! All week, rain-cold-drizzle... blech! 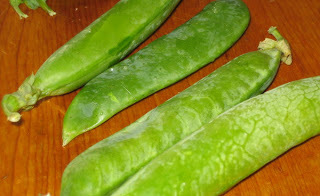 I picked up beautiful green peas at our local whole foods store (Choices). They were on sale, and quite fresh. I suspected our older girl would have fun shelling them with me... and she did! I opened up the pods and let her swipe the peas out into a bowl. She had a great time, and enjoyed seeing the different sizes of peas in each pod. Now, this girl LOVED peas through her first few years. I mean, I would take green peas (frozen, warmed in boiled water then drained) on outings with us for snacks. Yes, she loved them that much. Peas and corn kernels. Easy vegetables to give her, and she gobbled them up! Then one day, she 'stopped' liking them. I know their palates develop and move through likes and dislikes, but huhhhh? Green peas. They are sweet and fun to eat for kids, aren't they? So, I thought with her getting involved she would rekindle her love for the green peas. I sauteed them ever so briefly in a touch of Earth Balance (she loves this stuff, so I thought, again it might give the green peas an extra edge rather than using olive oil). Now, if you are cooking green peas - whether sauteing in oil and seasonings, or steaming, or however you cook them... cook just until they turn that bright green color. Then, taste test! Once the starchy pea taste has just turned the corner to that wonderful sweet pea flavor - they're done! And it just takes a few minutes. You'll see the color get brighter, and then quickly test. Remove from heat, and serve! Don't let these beautiful peas get overcooked and lose that vibrant, sweet flavor. For the girls, I pulled out some plain pasta and tossed it with olive oil and salt. Our sauce was just a bit too garlicky for them. Kids love 'plain' pasta. Anyhow, I topped their bowls with the peas too. I was excited to see the girls' reactions. After a couple of nibbles, not so impressed. I built it up saying "hey dad, Charlotte helped me shell these peas today, aren't they great?" Now, hubby has never liked green peas much himself. As a kid, his mom would give him a pea for each year (ex: 7 peas at 7 years - ha, he'd be in trouble if I had to dish up his peas now with that same formula!! he he). He told me he always hated them. Again, I don't get this. I understand if he was eating canned peas (and probably was). They are grey and mushy and not vibrant tasting. But these fresh peas... yummy! Sweet! As you can tell, I loved them. Sadly, I was the only one. But, I ate everyone else's. Their loss. 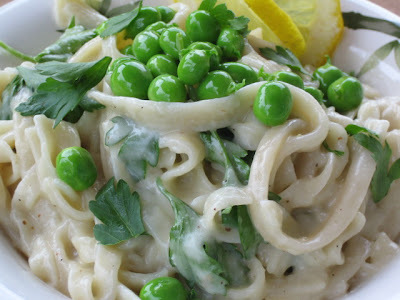 The pasta with the peas... it was all delicious. Btw, if you remember this potato salad post, you can now dive into the recipe in the current VegNews ("Picnic Panache" article, pages 70-71). It's delish, go get some of those seasonal new potatoes and make it for your next BBQ or picnic! That pasta looks ooooo so good! The sun just came out here in Virginia so I will send some your way but it is only in the 70's so I cann't send you any heat. I have never had fresh peas. I always have frozen and I hate canned peas. I hope they go on sale here so I can try them. I love frozen peas. Can't wait to try this new pasta sauce. We love garlic in our home! Peas are so yummy and full of protein. How can one not like them? They're everything good about summer. We haven't had much of a summer either here in Ottawa. The garlic pasta looks so delish and decadent. By the way, I broke down and bought the Everyday Dish DVD. It's so good. All three of you are so good in front of the camera. Julie looks like she was fun to work with. Did she have a bit too much vino before her segments? She had a permanent smile on her face. She looks like a hoot. 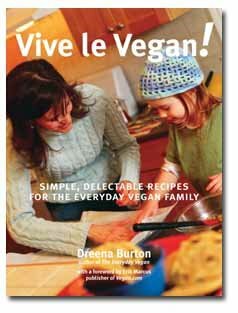 It's great to see delicious vegan food being prepared and it all looks so easy. THat lemon garlic pasta sauce sounds right up my alley. I would even eat it with peas, which basically the one vegetable I do not like (thanks to a childhood babysitter who tortured me with them). I can't believe that there's no non-dairy milk or cream in that! Oh and I'm with you- Where's the sun? Here in SF we've had rain too. And this morning we were woken by a quake! Aside from a couple of good downpours in the past couple of weeks, we've been dry, dry, dry. There's was water ban here and the grass was so brown, I was afraid that when I walked across it, the friction would cause it to burst into flames. Things are looking a bit better, but now we're being warned that it's going to be roasting hot in August. My East Coast blood can't take the heat! Enough about the weather. Peas have always been a favorite of mine. Through the winter, it's frozen, but I'm with you on the fresh bounty this time of year. YUM! They look and sound great with the pasta dish. And I did see your potato salad in Veg News. Along with the sandwich recipe that sounds great too! with all your pea talk you forgot to mention we can also vote for you twice on the Veg News fave awards. I finally got the Everyday Dish dvd!! I watched the entire thing (almost) in one sitting. It's SO wonderful! You ladies are awesome. I've already tried Julie's Deli Soup (YUM) and I am going to make your Chickpea Sensation patties tomorrow. They will be great to have in the fridge for Matt-because my schedule has been super busy lately. I have a partial review up on my blog, but will add much more when I make more dishes. oh, and I have to be girly and say your hair looked SO freaking cute in the DVD when it was all up in pigtails! 3veggies, there's no figuring them out, is there? I used to hear when I was just pregnant "just when you think you have something figured out, they move on to a new stage". That seemed cynical to me at the time, but now I see it's true - from eating to developmental stages, behavioural issues, etc. Us parents, we're just taking it day by day, making it up as we go along!! I'll take sun - or some heat, either wouldn't go astray here right now. Veg-a-nut, do try them if you get the chance. They are somewhat similar to frozen, but with more texture to bite into, and when you shell them they range in sizes more than frozen. Yes, canned peas are like most canned vegetables (with the exception of a few like canned tomatoes and artichokes) - mushy and icky! Veggie vixen, I know! (and how could someone formerly wearing the 'sweet pea' badge not love them and come to their defense?!) Oh, I'm so pleased you are enjoying the dvd, thanks! You know, we didn't even do our segments together. I (unfortunately) haven't even met Bryanna, and when I was in Portland I did all my segments in those couple of days. Julie did a couple before I arrived and then the remaining segments afterwards. That's funny... Julie was lovely to work with (hey, I missed out on that wine tasting - next time 'round)! Omg Teresa, are you okay from the quake. I'm assuming it wasn't too big, but are you shaken about it? We had a quake here almost 7 years ago, and it was one freaky thing to be in. I hope you're okay. Thanks about the pasta, yeah it looks very creamy but it's simply the starches from the pasta mixing with the emulsified sauce... kinda' cool! 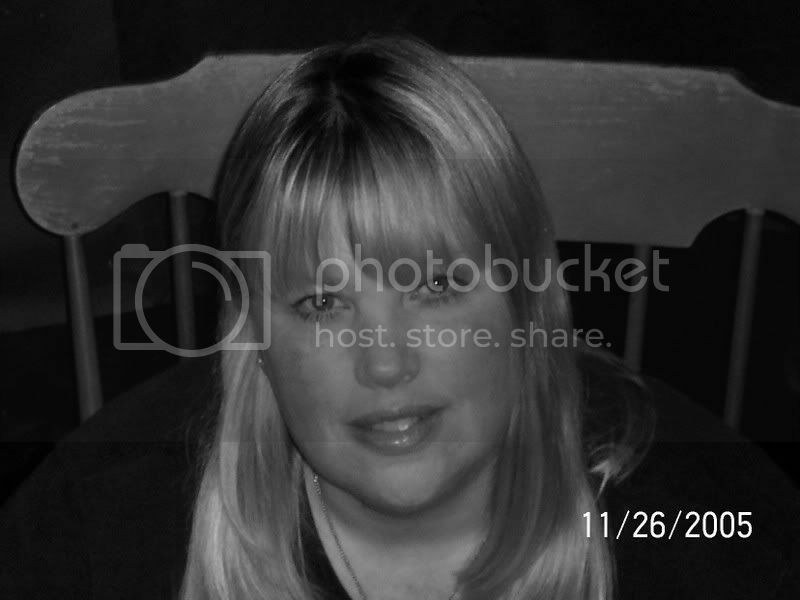 Hey Carrie, I like the new profile pic! Wow, that's some hot weather - not nice when the grass dries and crunches out either. We've had rain, rain, rain all week, but then this is the 'wet coast'! Hi Shangrilewis, now, does your mom have a secret to get them loving those peas? I'd love to know...! I'm an adult--or at least I play at being one--and I hate peas, too. The sweetness actually bothers me; it's too much, or too unexpected, maybe. I feel like I'm waiting for the other shoe to drop. And on top of that--the texture. UGH. I can't stand the mushiness. Even though I eat almost everything I didn't eat as a little girl, and I wasn't very picky then either, peas and lima beans are still--ick!